Trick or Treat! While the traditionalists are handing out candy, we are doling out names. Many perfect options for the dog born on or around October 31 may be found throughout this page. Typical names include Pumpkin, Candy, Carve or anything commonly associated with the holiday. Scary movies provide a wide variety of horror-filled ideas. Freddy, Jason, and Carrie are some options taken straight from the classics. The most notable part of Halloween has to be the trick-or-treating. On a typical door-to-door journey a person will encounter many creatures. Ghost, Guise, Demon, and Vampire are a few that would make for a spirited name. We have covered all aspects of Halloween to ensure that you spend less time thinking of names and more time carving a pumpkin, choosing a costume, or bobbing for apples. 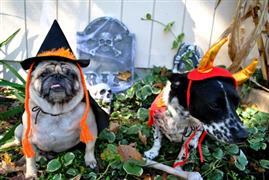 Enjoy this compilation of the best Halloween themed dog names on the web. Some of our pages will contain a subcategory. A subcategory is a slightly more specific grouping than the main topic of the page. For a subcategory, we will include a separated table of names and corresponding descriptions. An example of a subcategory of Red Dog Names would be 'Dog Names Inspired by Red Wines'. If you have any subcategory ideas for the Halloween Dog Names page, we would love to hear them. Use the form below to submit your ideas.